Myiasis-causing larvae were extracted from dogs attending veterinary clinics in Plateau State, Nigeria and subjected to molecular analysis involving polymerase chain reaction amplification of the 28S rRNA gene of blowflies, cloning and sequencing techniques. All larvae were confirmed as Cordylobia anthropophaga Blanchard (Diptera: Calliphoridae) after the initial morphological identification. This is the first molecular identification of any myiasis-causing fly species in Nigeria and may serve as a reliable alternative to morphological identification where samples are not well preserved or difficult to identify to species level. The infestation of vertebrate animals with larvae of dipteran flies is refered to as myiasis. Skin injuries on animals or the presence of excretory products (urine and/or faeces) in dry sand or clothing serve as an attractant to the flies. The flies subsequently lay their eggs in wounds or sleeping places of the animals, especially on straws, sand and sometimes on urine-smelling clothing (Ockenhouse et al. 1990). Hatching of eggs and the eventual penetration of larvae into the skin occurs through contact with the larvae from the environment or clothing; subsequently, the larva feeds and thrives on dead or living tissues and body fluid. Growth and development of the larvae from the first to the third instar larvae and the eventual pupae occur within a set time (depending on the fly species involved in the myiasis), but is determined by temperature rather than humidity (Stevens & Wall 2001). Non-migratory cutaneous furunculoid myiasis of animals and humans in the tropics (Africa) and subtropics (South America) are usually associated with Cordylobia species (Cordylobia anthropophaga, Cordylobia ruandae and Cordylobia rodhaini) and Dermatobia hominis (Diptera: Oestridae), respectively (Adam et al. 2006; Olumide 1994; Tamir, Haik & Schwartz 2003). However, canine myiasis is mostly due to C. anthropophaga because dogs, humans and small rodents serve as reservoir hosts for the larvae (McGraw & Turiansky 2008). The prevalence of canine myiasis associated with C. anthropophaga in Nigeria varies. Ogo et al. (2009) reported a 100% prevalence, suggesting a preference for dogs, although many myiasis-causing flies are endemic to the country (Olumide 1994; Oluwatosin & Fadahunsi 2003; Uva & Onyeka 1998). Several methods are used for diagnosis of myiasis in Nigeria (Dipeolu 1975; Dipeolu & Olufarati 1975; Idowu & Olotu 1976). These include clinical presentation, morphological characterisation of the larvae (e.g. slits of the posterior spiracles located on the posterior spiracular plates) and occasional identification of the adult fly. The time-consuming method of definitively rearing larvae to adults under soil and temperature-dependent conditions is also used occasionally. Advances in molecular techniques provide a new impetus to the diagnosis and identification of a broad range of organisms, including myiasis-causing flies (Hall et al. 2009; Stevens & Wall 2001). Molecular identification can be used on dead, live or preserved samples. The fact that it can be used effectively on all larval stages will eliminate the need to rear the larvae to adults for identification (Ames, Turner & Daniel 2006). Several genetic markers from mitochondrial DNA [cytochrome oxidase gene (COI, COII, 12S mtDNA)] and ribosomal DNA (16S rRNA, 28S rRNA) have been used in identification, population and evolution studies of myiasis-causing flies of the families Oestridae, Calliphoridae and Sarcophagidae (Otranto & Stevens 2002). This study reports on the use of polymerase chain reaction (PCR), cloning and sequencing of the 28S rRNA gene of blowflies as an aid in the identification of C. anthropophaga larvae from dogs in Nigeria. Different stages of larvae (N = 200) were randomly collected from the dermal layer of the skin of 50 dogs visiting veterinary clinics in Jos South (9º47'N, 8º51'E) in Plateau State, Nigeria. Each extracted larva was preserved in 70% ethanol for molecular studies. Morphological identification of the larvae was performed at the Department of Parasitology, National Veterinary Research Institute, Vom. Identification of C. anthropophaga was based on morphological characteristics and the presence of three slits at the posterior spiracular plate of the larva, according to Hall and Smith (1993) and Soulsby (1982). As a confirmation of such identification, we subjected larvae to molecular analysis at the Instituto de Investigacion en Recursos Cinegeticos IREC (CSIC-UCLM-JCCM) in Ciudad Real, Spain. The larvae were washed in distilled water for 1 hour before drying in a laminar flow cabinet under ultraviolet light. Individual larvae were placed on a Petri dish in 1 mL phosphate-buffered saline (pH 7.4) and dissected using a sterile scalpel blade. The internal organs were collected with a watchmaker's forceps under a stereo microscope (Nikon SMZ 1500, New York) and transferred into 1 mL TRIzol reagent® (Sigma-Aldrich, St. Louis). DNA was extracted according to the manufacturer's instructions (Sigma-Aldrich) and stored at -20 ºC after the DNA concentration had been determined using a Nanodrop® ND 1000 spectrophotometer (Nanodrop Products, Wilmington). PCR amplification was initiated by using the forward and reverse primers D1F: 5'-CCC CCT GAA TTT AAG CAT AT-3' and D2R: 5'-GTT AGA CTC CTT GGT CCG TG-3', which amplify the 28S rRNA D1-D2 regions of blowflies (Stevens & Wall 2001). The primers and other reagents in the reaction mixture included the DNA template (50 ng/µL - 150 ng/µL), 10× high-fidelity PCR buffer with 15 mM MgCl2 (5 µL), deoxyribonucleotide triphosphate mix (2 mM of each base), 10 pmol of each forward and reverse primer and high-fidelity PCR enzyme mix (5 u/µL) made up to 50 µL with nuclease-free water. Conditions for the PCR were an initial denaturation at 94 ºC for 2 min, followed by 30 cycles of denaturation at 94 ºC for 1 min, annealing at 55 ºC for 2 min and extension at 72 ºC for 1.5 min. The reaction terminated with a final extension step at 72 ºC for 10 min. Control reactions were performed without the addition of DNA to the reaction so as to rule out contamination during PCR. Electrophoresis of the amplicons from the PCR on 1.5% agarose gel was used to calculate the size of the amplified fragments compared to a standard molecular weight marker (1 kb MassRuler®, Fermentas). The amplicons were purified with the Purelink™ purification kit (Invitrogen, Carlsbad, CA) according to the manufacturer's instructions, then ligated into the pGEM®-T Vector System I (Promega, Madison) and transformed into JM109 high-efficiency competent Escherichia coli cells according to the manufacturer's protocol. The transformed cells were subsequently plated on X-ga PTG plates (IPTG, isopropyl β-D-1-thiogalactopyranoside). The small colourless positive transformants were selected and cultured overnight in lesogeny broth-ampicillin medium at 37 ºC. Plasmid DNA was purified with the QIAprep® Spin Miniprep kit (Qiagen, Valencia, CA) whilst a Proteus vulgaris II enzyme (Pvu II) kit (Fermentas®, Vilnius) was used to digest the plasmid DNA for size evaluation on 1% agarose prior to sequencing. At least two clones from each purified plasmid were submitted for sequence confirmation in an automatic sequencer (3730 DNA analyzer, Applied Biosystems®, Carlsbad, CA). Our sequences for C. anthropophaga were compared with sequences previously deposited in the gene bank using the basic local alignment search tool (BLAST) of the NCBI database (http://www.ncbi.nlm.nih.gov/BLAST). In the phylogenetic analysis, sequence alignment was obtained by using BioEdit software (version 5.0.9) (Hall 1999). The GenBank accession numbers of the 28S rRNA gene sequences used to construct a phylogenetic tree were C. anthropophaga 'isolate Yaounde' (AJ551432) and Oestrus ovis (AJ551428) as an out-group. The distance matrix was calculated by use of Kimura-2 parameters, whilst 1000 bootstrap replicates were used to estimate the reliabilities of the nodes on the phylogenetic tree. A bootstrap value of 70% is considered significant evidence for phylogenetic grouping (Hills & Bull 1993). The output of the tree was constructed with the MEGA 4.1 program (Tamura et al. 2007). Animals were handled humanely during sample collection, under the supervision of veterinarians, and procedures complied with Nigerian laws. All the intact second- and third-stage larvae examined were positively identified as C. anthropophaga and showed the typical morphological characteristics of being oval in shape, with an average size of 11 mm - 16 mm. DNA amplification for the 28S rRNA gene of blowflies, using an amplicon size of 651 base pairs, was obtained. A BLAST search for all the cloned and sequenced amplicons recorded across the DDBJ/EMBL/GenBank databases showed 98% - 100% similarity to the partial 28S rRNA gene of C. anthropophaga 'isolate Yaounde'. The sequences from our samples were all identical, resulting in the submission of only one sequence to GenBank under the accession number JF806640. 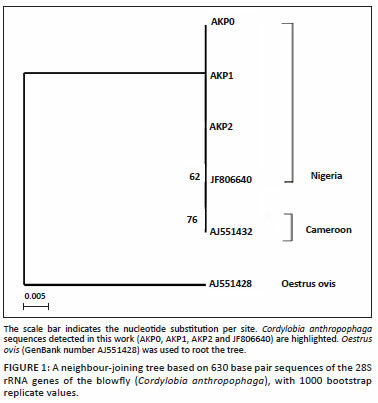 In the phylogenetic tree shown in Figure 1, our sequences were clustered with C. anthropophaga 'isolate Yaounde' from Cameroon with 62% as bootstrap value. This low value infers a close relationship between the two strains. Cutaneous myiasis usually presents with numerous erythematous, furunculoid skin lesions on any part of the body and oozes serous fluid. Pressure on such lesions lead to the expulsion of the larvae and liquefied tissue. In the tropics, myiasis may be caused by the larvae of different Dipteran flies, attracted by the humidity and temperature of the microenvironment of the skin. Broken or wounded skin is at a higher risk of infestation (Farkas et al. 2009). In Nigeria, cutaneous myiasis in both dogs and humans is usually attributed to C. anthropophaga, with the majority of the reports from the western and northern parts of the country (Dipeolu & Olufarati 1975; Edungbola 1982; Ogo et al. 2009). The fly is also present in the neighbouring Cameroon (Guillozet 1981). The close proximity between Nigeria and Cameroon may account for the similarity in identity and phylogenetic analysis of the sequences obtained during our study and those reported by Stevens and Wall (2001), thus suggesting that the same strain is circulating between the two countries. Molecular identification as reported here can be used in addition to morphological identification based on the physical characteristics of the larvae and the specific posterior spiracular plates of C. anthropophaga. However, the reported method provides unambiguous results and could therefore serve as an alternative to morphological methods when preservation methods are not optimal or when there is doubt about similar or closely related fly species. This method can also be applied in animal forensics to determine the period of neglect or abuse and time of death of an animal by identifying the larvae and fly species present on carcasses (Anderson & Huitson 2004). The use of molecular techniques in the identification of C. anthropophaga larvae in Nigeria suggest that the technique may also be useful in studying other aspects of larval infestation, such as epidemiology, pathogenicity, population genetics and the mechanism of resistance to pharmaceutical compounds. We thank Dr. Isabel Fernández de Mera for her advice during sample analysis and the Head of Research, Animal Health Group at the Instituto de Investigacion en Recursos Cinegiticos, IREC (CSIC-UCLM-JCCM), Ciudad Real, Spain for providing the facilities to carry out this research. N.I.O. (National Veterinary Research Institute), E.O. (National Veterinary Research Institute) and O.O.O. (Department of Veterinary Parasitology) conceived and designed the project and were all involved in sample collection and morphological identification of the larvae. N.I.O. (National Veterinary Research Institute), R.C.G. (Instituto de Investigacion en Recursos Cinegiticos), J-M.P.d.l.L. (Instituto de Investigacion en Recursos Cinegiticos) and J.d.l.F. (Instituto de Investigacion en Recursos Cinegiticos) conducted the molecular studies. N.I.O. (National Veterinary Research Institute) and O.O.O. (Department of Veterinary Parasitology) wrote the manuscript.